It's kind of tough to think about anything but the inauguration today. I've begged my sister to send many pictures from the mall, but she's also got to keep an eye on my handsome nephew/godson. I don't think, however, we'll be suffering from a lack of inauguration photos on ye olde internet. Below is an extra photo from Gap 34th Street that I was going to post this weekend until SOMEONE decided to not bring the laptop home from school. Students! The outfit, however, I find very classic Americana. You know, flare jeans, biker jacket and plaid shirt. Happy Inauguration Day to all! I'm not sure what one calls this color (light tobacco?) but I love it, it feels very American guy circa 1970. You know, one of those colors you would have never bought then but find irresistible now. 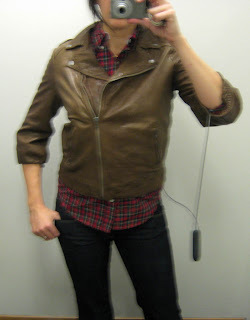 Gap biker jacket, $298, flare jeans on sale for $27.97. Ooooh, love every piece individually, and the whole outfit as a package. I've longed for that jacket ever since the Gap put it out on racks months ago. yup, waiting for it to go on sale! Really cute jacket but $298 for something from the Gap?! Ceeee-ute! I think this outfit calls for dancing to some "bye bye miss american pie"
Love that jacket! It looks so fabulous on you too! Hi there-you look fabulous in this outfit!! I dig the leather jacket, kind of Springsteen American Guy HOT!